The power of words can have an unforeseen negative or positive impact on your life. At some point someone has directed one or more of these words towards us … dumb, stupid, idiot, ignorant, asinine, inane, despicable, egregious, ugly, fat, failure, repulsive, substandard, jackass, moron, reject, etc! Whether delivered in a fit of anger or as simply a mis– intended comment meant to be funny, the power of these words can leave a lasting negative impression on ourselves or others. Why? Because negative words like these form the basis for criticism. In its original meaning criticism is derived from the Greek word ‘critic’ which means to separate, to pull apart, to tear. Most people are not aware of the power of words they use in their everyday conversations. They don’t see how their choice of words may be keeping them stuck or perpetuating unbearable situations in their lives. For example when we say, “this is going to be so hard,” “There is no way I can succeed,” “I will never be smart enough, pretty enough, good enough to …” we are setting ourselves up for failure. Negative words come from our negative thoughts. The subconscious part of your brain (amygdala) does not distinguish the difference between what is real and what is not, it simply reacts in a basic fight or flight response to a stimulus (thought) or moves it to another part of your brain where you can reason. An imagined fear or negative thought releases powerful stress hormones into your body. Over time this stress begins to break us down physically, mentally, emotionally, and spiritually. So how do use the power of words to change your life and get what you really want? Pay attention to your words and the words of others when communicating. 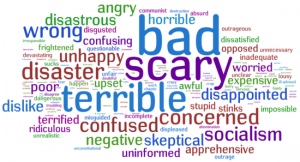 If you do you will begin to see just how prevalent the use of negative words is in your daily communication. Awareness is 75% of the solution so you’re already 3/4 of the way there. Congratulations! Arm yourself with a list of positive words. In fact here’s a link to a couple hundred to start with … Positive Words . Choose 5 words off this page that appeal to you or you would love to hear said back to you. Now that you are armed and dangerous, be intentional about inserting those 5 words into all of your communications the rest of this week, especially with yourself. Next week pick 5 more! The power of words can have an amazing impact on your mental, physical, emotional, and spiritual health … so choose to be healthy! PreviousPrevious post:Non-Verbal Communication Skills Not Working?NextNext post:Are You … Your Greatest Asset?